This is the forty first in a series of reviews of the best dive resort locations around the world. In this post, the focus is the Azores. Background – Situated 1,360 kilometers (850 miles) west of Portugal, 1,507 kilometers (936 miles) northwest of Morocco and 1,925 kilometers (1,196 miles) southeast of Newfoundland are the nine volcanic islands of the Azores, an Autonomous Region of Portugal. Due to their location in the Gulf Stream, the climate is much milder than one might expect at that latitude. 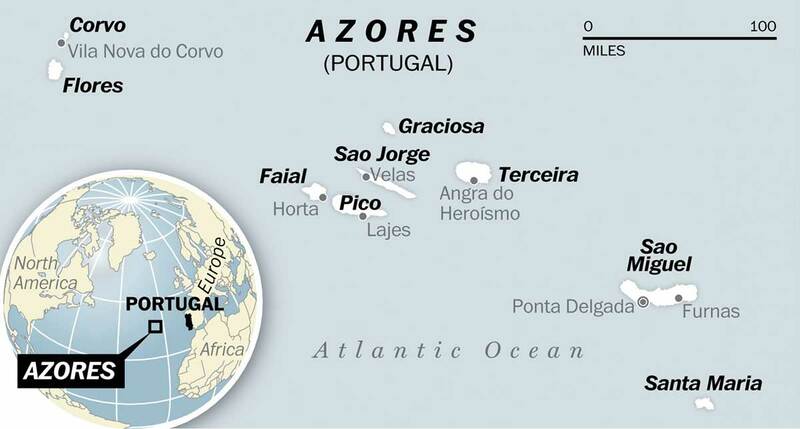 The Azores cover a fairly broad area with the islands of Corvo and Santa Maria nearly 640 kilometers (400 miles) apart. Discovered by the Portuguese in 1427, they were historically a mid point for transatlantic sailors and local commerce was based on that. Settled sporadically since that time there is substantial variance from island to island in culture, dialect, cuisine and traditions. Aside from the Portuguese, others that found their way to the Azores and influenced development were Africans, Moors, Jews, Scots, Germans, Italians, French, Spanish and Flemish. At the same time, while all the islands have volcanic origins, each has its own geomorphologic characteristics. There are mountains, with Mount Pico the tallest at 3,551 meters (7,713 feet), hydrothermal vents, hot springs, lagoons, waterfalls, dense forests and sea mounts. The population today of 247,000 relies on dairy farming, livestock, fishing and increasingly on tourism to fuel the economy. Portuguese is the main language of the islands, but many also speak English. The main capital is Porta Delgado on São Miguel, the most populous island. Undersea World – Volcanic origins and position in the Gulf Stream have combined to give the Azores a unique and rich undersea life. The flow of water from more tropical areas brings with it an abundance of nutrients like plankton, krill and shoals of small fish which attract some of the world’s most fantastic predators. The topography is characterized by rocks and boulders, canyons, walls, crevices, overhangs and caverns with encrusting colorful corals, sponges, gorgonians and algae, which provide excellent habitat for a range of interesting creatures like slipper lobsters, tubeworms, scorpionfish, frogfish, crabs, moray eels, starfish, fireworms, nudibranchs and octopus. Colorful reef fish also residing nearby include grey triggerfish, parrotfish, pollack, snappers, stingrays, huge groupers and numerous schooling fish. What makes the Azores incredible, though, is the long list of pelagics that pass through sometime during the year. Here are some of them: huge schools of amberjacks, barracuda, and eagle, manta and mobula rays, up to 40 in a school, shortfin mako, blue, hammerhead and whale sharks, turtles, wahoo, tuna, marlin and 24 different species of cetacean. Each island has excellent sites surrounding it where many of these creatures can be seen. There are also several prominent sea mounts relatively far from the shoreline that have a greater possibility of seeing the pelagics in great numbers. In addition, records show 600-700 ships lost around the Azores between the 15th and 20th centuries. The good news is that many have been explored and are on the itinerary of the local dive shops. Seasons and Conditions – There is significant seasonal variance in temperature and rainfall. Average high air temperatures hit annual lows in February of 16.6 °C (61.9°F) and annual highs of 25.3 °C (77.5°F) in August. In February and March water temperature averages 16°C (60.8°F). The August average is 24°C (75.2°F). When the water is at its warmest divers will probably find a 5 mm wetsuit appropriate. At its coolest a 7 mm wet or semi-drysuit, or drysuit would be in order with hood and gloves. It rains quite a bit throughout the year with the wettest time from October to March. Many hurricanes get their start in this region, though are generally far from their peak of power exhibited when they reach the Caribbean. Visibility would rarely be less than 10 meters (35 feet) and sometimes as good as 60 meters (200 feet), especially on the offshore seamount dive sites. Check out the videos for an idea. Some sites can also have strong currents. 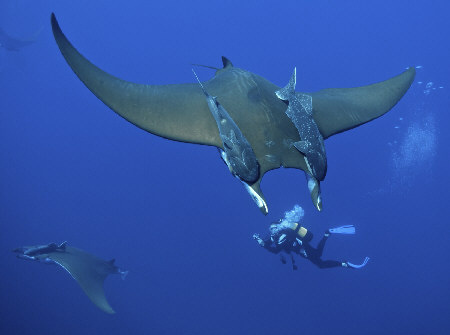 From June to October the mobula and manta rays and whale sharks are much more likely to be sighted. Whales and dolphins can be seen year round with a greater possibility in March and April. There are well established dive shops on all the islands that can handle dive courses, equipment rental and guided dive tours including charters to the sea mounts and more distant sites. Each island has its own airport. The airports on São Miguel and Terceira have daily flights from the US, Canada and Europe. The Pico and Faial airports have international flights from Lisbon only. These 4 airports and the airports on the rest of the islands all have domestic flights on SATA, an island linking airline with frequent flights in 40-80 seat turboprop airplanes. Cars, motorbikes and bicycles are for rent and gasoline is cheap. Taxi service with English speaking drivers is also available in most places. Bus service is cheap and slow and scheduled based on the working day of the citizens. The ferry service between the central islands is consistent. All the islands have full service dive shops. Tourist traffic slows down a lot during the winter months, but they are still open and ready for action year round. There are many dozens of resorts, hotels, guest houses and condos available on the Azores from $10 to $169 per night. The website linked below is a good source for the available options and can arrange booking. To navigate to different locations within the Azores on the website, enter one of the city names from the map above or on the accommodation website into the search box at the top left of their page. The Azores has an intriguing history and culture and fantastic volcanic terrain with a varying natural environment from island to island. There are many fascinating things to do when you are not diving. Here are some possibilities of things to see and do: black sand beaches, geysers (taste food cooked underground), thermal springs and baths, volcanoes, caverns, caves, lakes, forests, wildlife areas, cultural tours, whale and dolphin cruises, canyoning, trekking and mountain climbing, Jeep tours, cultural and landmark sight-seeing tours, horseback riding, shopping and city tours, restaurants and local food. As you can see most of the activities are related to the unique natural setting and culture. The Azores is not really a party time sort of vacation, though. Please check out the video below for a glimpse. Thank you very much for sharing with us such an important blog. If I did not read this blog I would not be able to find such details about the Azores. This blog will be very helpful for those who want to develop diving skills. The most important thing I just learned from here is that this is the forty-first in a series of reviews of the best dive resort locations around the world. I will definitely share this blog with my friends. I appreciate your kind comments and interest. I have these more than 40 reviews of resort locations and another 40 or so reviews of liveaboards to such diving areas, as well. If you have the interest, those could keep you and your friends busy reading for a while. I hope by reading you will get a chance to go to one of the places and do some diving. If there are any questions or comments regarding anything concerning scuba diving, please let me know. I am an aquaculturist and presently doing my masters in the field so the thirst for scuba diving and its blogs is number one on my priority list. I love the work you are doing here in bringing to others the knowledge they haven’t come across. I really enjoy your blogging and can’t wait to see your next post. Thanks for your interest and support. Good luck with your studies. Hi Joe, I am a fan of your scuba diving articles and enjoy reading them. The descriptive analysis of Azores’ background and its undersea world is intriguing. Wow! Azores has so many diving sites, out of these sites you listed, I am fascinated with the Shrimp Cave. It is interesting to know that one can as well engage in other things aside from scuba diving. Thanks for your fascinating write up on Azores. The Azores is the most lovely place. I went there and did some swimming and saw how beautiful the underwater world is, but haven’t yet gone very deep. Your videos have really tempted me to take a diving course so I can get down there among the variety of life you showed. I may get a chance to go there again, or perhaps someplace else and will take the class so I can get the full enjoyment. Thanks for your kind comments. If you would like any advice about diving, equipment or locations to do the course, please let me know. Best of luck to you. I’ve never tried scuba diving before but I’m hoping one day my story will change and I’ll try it on a vacation. Because, I can’t resist the sight the beautiful creatures and the topography characterized by colorful rocks and boulders, canyons, walls, crevices, overhangs and caverns with encrusting colorful microflora and fauna, and excellent habitat for a range of interesting creatures below the water. I can’t wait for a day when I’ll catch a chance for such a wonderful experience. Thanks for the fabulous review. Thanks for your glowing comments. I hope you get a chance to go to the Azores. If you want to learn to dive there are many shops there that would be happy to do it. It takes 3-5 days. If you have questions about that, let me know. The life underwater in the Azores is extremely breathtaking due to the presence of hydrothermal vents which eject manganese nodules, gas hydrates and other nutrients that have economic value and as well important for the life underwater. Scuba diving in this region is going to be an experience to behold. I hope I get a chance to go there soon. Thanks a lot for your enlightening post. Thanks a lot for your interest and comments. I’ve read a bit about hydrothermal vents but was unaware of manganese nodules being ejected from them. I hope you get a chance to dive in the Azores soon. Hello Joe, what an amazing review this was. I loved the fact it was very in depth and described the climate, topography and all other factors to be considered. Also, I enjoyed the videos and although I have never scuba dived (I intend to someday), this just made me want to do it sooner. Thanks a lot for your kind comments and interest. If you would like to do some diving someday most of the places I review on my site are well capable of doing the course with you. It is possible to do it in many other places as well. If you would like some help finding a convenient place to do it, please let me know. Wonderful post, I’m a marine geoscientist and I have been studying up on areas that are beautiful and possess a wonderful experience for diving. From your post, I’m very sure the Azores is one of them and I’m definitely going to visit there sometime. I have all the information I need from you and I’m definitely visiting your site more to find more places like the Azores. I appreciate your kind comments. If you get to the Azores, please send me a note telling about your trip. Otherwise, I have nearly a hundred of these reviews on my site and will appreciate it if you can come back for more. Similar places that I have been to are evil forest, Mambila and Obudu cattle range in Nigeria. Tourism is one of the best ways to enjoy and learn more about nature. For a place whose development has been influenced by 7 different culture, it is a point of interest to me. Over 600 ships lost around the Azores, and lots of aquatic animals to feed my curiosity. With each of the islands having her own airport, this is a nice destination and I’d like to add it to a list of beautiful places where I would love to have a holiday soon. Of course, I would not be coming there for scuba diving alone. It only makes sense to enjoy other activities like mountain climbing and dolphin cruising. This is high-value review of the Azores. Thank you. I am glad you enjoyed my post. Thanks a lot for your interest and kind comments. I hope you get a chance to go there sometime.